Thanks to Interscope Records we have 5 copies of the La La Land: Original Motion Picture Soundtrack to giveaway to some lucky fans. La La Land: Original Motion Picture Soundtrack — which features songs from Lionsgate’s upcoming original musical, La La Land, starring Emma Stone and Ryan Gosling — is now available for pre-order via all digital retailersHERE. The album is due from Interscope Records on December 9th, the same day the film opens with a limited engagement. 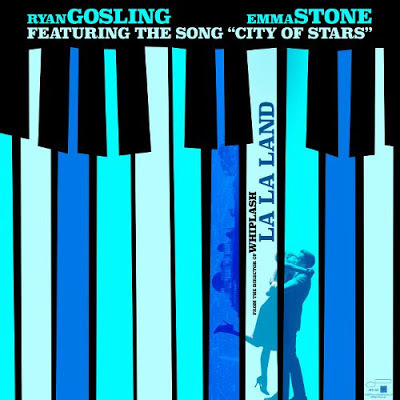 Those who pre-order the soundtrack album will receive an instant download of “City of Stars,” which is sung by Gosling and Stone. Listen HERE. Songs on the soundtrack were written by Justin Hurwitz, Benj Pasek and Justin Paul. The album was produced by Justin Hurwitz, Marius de Vries and Steven Gizicki. Written and directed by Academy Award® nominee Damien Chazelle, the eagerly awaited movie will open in Los Angeles and New York on December 9th and expand on December 16th.